This morning I loaded the crock pot with potatoes, peas, and chicken legs. Then I made breakfast and checked in with my online world. Usually by the time I’m done, Phil has come in and I’m off to work on something. I mixed a batch of soap and got all that cleaned up and ran a load of laundry. Then I did my morning workout using my Wii Fit Plus I got for Christmas. Lately I’ve been doing a combo of the Wii Fit Routines and choosing enough so they add up to about 30 minutes. We had blowing snow for a few hours but only a light dusting was on the highway. 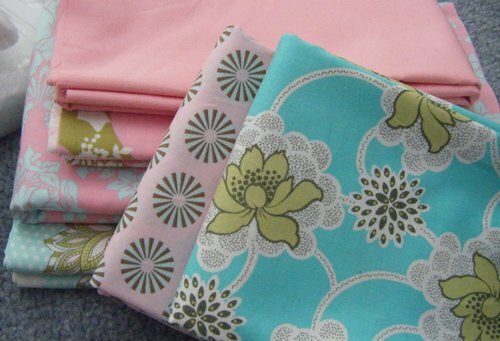 Once I was home, I cleaned up some of the lunch dishes and headed to my sewing room. 🙂 I only have 2 more shirts to add to the quilt and then assemble the sections I have together. The center is nearly done! I was glad to have 2 hours to sew this afternoon. I came upstairs and did a Total Body Workout with Jillian & the Wii. I have the 2010 Ultimatum. It is all right, a good workout, but the flow of the program is archaic. Makes me think of early computer games! LOL!! I did TBW – B which is about 30 minutes. It is hard for me but I did much better today than the previous days! The 60 SETS of obliques followed immediately by 99 SETS of bicycle about do me in!! I’m not 100% on those yet. After that I finally sat and spent time online. After seeing some new hat pictures from K, I made supper. I’m enjoying the treat of sugar-free whole wheat biscuits so made a batch for tonight. I gave them the choice of soup or leftovers to go with the biscuits. I planned to head back to sewing after supper but then saw Phil getting a bucket of soapy water. He had his office so emptied, it was time to wash the walls!! Blech!! I helped and it didn’t take too long. He continued working by taking off the baseboards and then I washed them. I washed the window frames and the windows. Maybe we can start painting by the weekend. I’ll get new joint compound tomorrow. Nearly 35 yrs as an office has left a LOT of holes in the wall!! Ack!! Saturday was the Pre-Bowl sale at the Galena quilt shop so I headed out at 7:35 a.m.! It was a bit foggy but visiblity was just over 1/4 a mile or so … it was OK for driving. The line to check-out is always long and the store owner runs the check-out on this big sale day. I don’t think she does it often so it takes her longer than the other workers. ??? I probably held my pile of fabrics (including one of the bolts b/c the sku number was hard to read) for a good 30 mins. Sunday I realized my biceps had a better workout than I accounted for! I got the pattern and a kit for all the extra things you need. I’d love to make more but will test out one pair first. Then I’ll hit a sale at Joann’s for the extra things like gripper fabric & foam. In the classroom, were 2 large racks of bolts all on sale!! 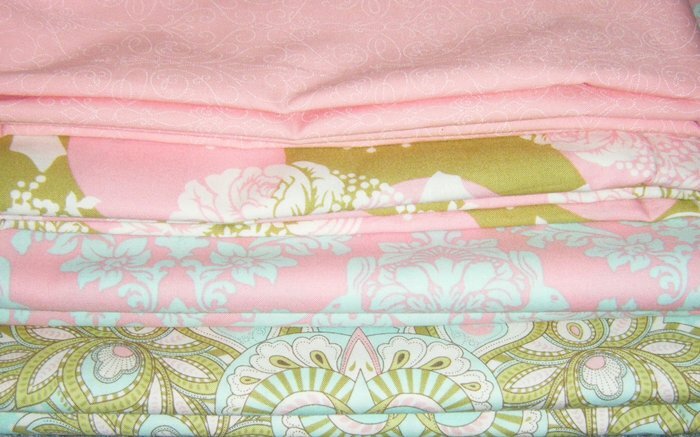 One of my favorite designers is Amy Butler and there had to have been over 25 bolts of her fabric at 40% off!!! >happy dance! !< I chose from those sale racks for my slippers. There are 3 sections to the slippers and I am thinking of using the pink for the ties & binding. I was at the shop for 1 hr and 20 minutes. I stopped by Panera to grab a quick bagel for the way home (cuz I just love an upset stomach I guess…) and saw a dear friend from awhile ago! Carol & her husband were there finishing lunch and it was so delightful to chat with them a bit! Carol owned the quilt shop nearby when I started quilting in the late 1980’s. She is a dear!! The fog was much thicker by then and visibility was poor. Thankfully it was still “daylight” so that made seeing easier. I got home and started cinnamon rolls for JP to take to share with the band on Sunday. He had already left to play for the Saturday services. We headed up for early church and I baked the rolls when I got home. I added these 2 new projects to my inventory of projects list. Ha! Another 2 hrs on the tshirt quilt today has me working on the next to last row. 🙂 Yahoo!! 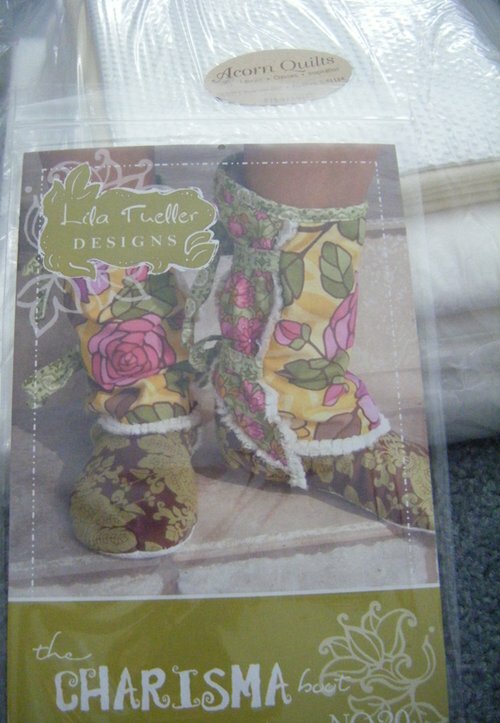 Yesterday my feet were SO very cold, I was really wishing for these boot slippers to be done. Isn’t that how it always is! After I scooted my suitcase and pile of dirty clothes out of the way :blush:, she reached to the shelf in the closet and pulled down a box. 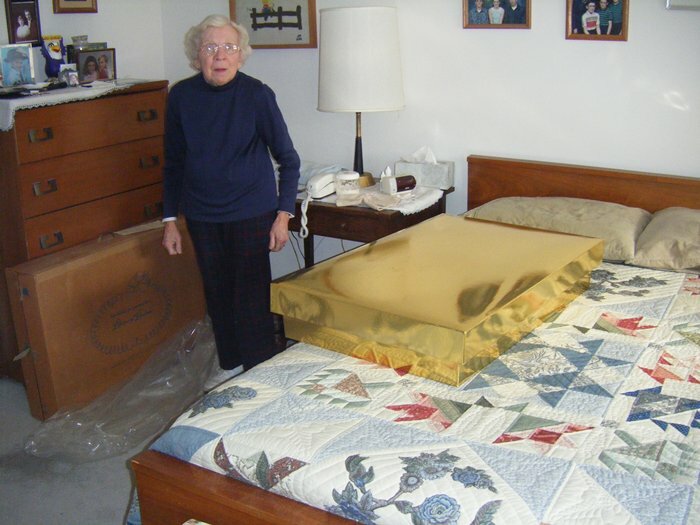 Not very big, but now I realize, bigger than one of those bulk envelope boxes she used to bring home from work. 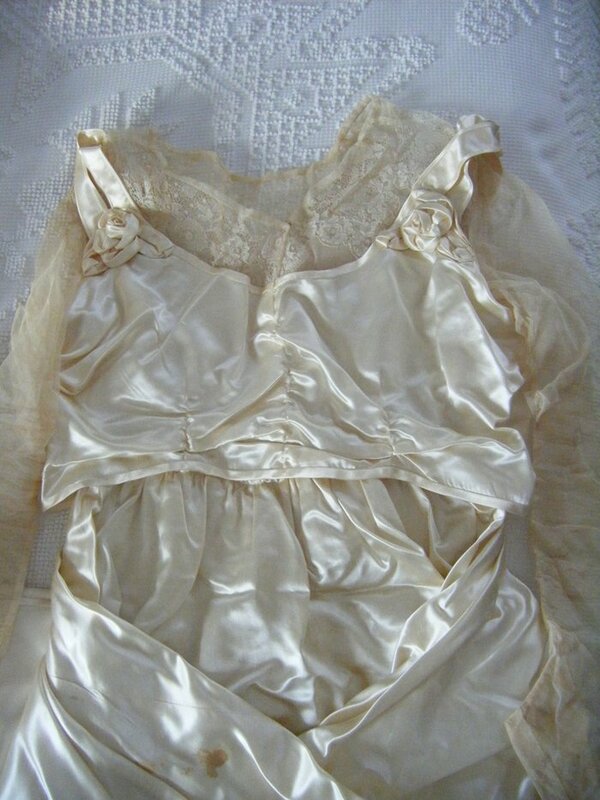 Inside was MY grandmother’s wedding gown from 1915!! This is the first glimpse as we took off the lid and the layer of tissue. 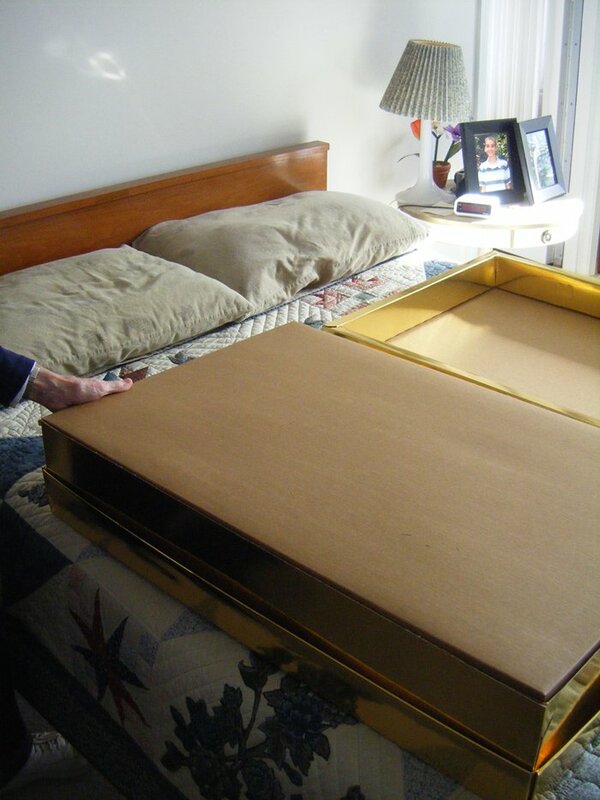 This is the top layer in the box. Now after all our studying… we don’t know where this goes. Maybe it wasn’t even used for the wedding. But the back of the bodice sure is cute!! 🙂 The back tucks in behind the bow and there are snaps on that part that could snap onto the waist of the dress. This just isn’t in the picture. There are snaps on the one shoulder. 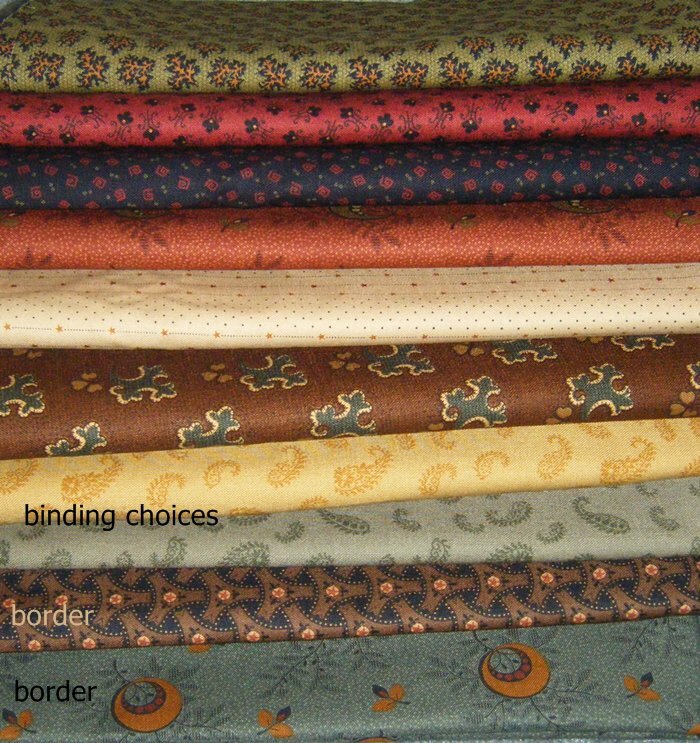 The bias binding is machine stitched and then hand stitched under like in quilt binding. 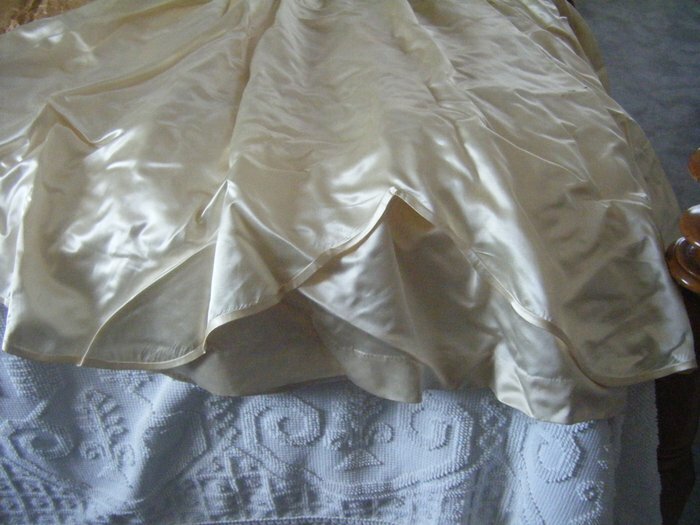 The top of the dress. I still had the skirt folded in for this picture. But there is a spot there on the skirt. 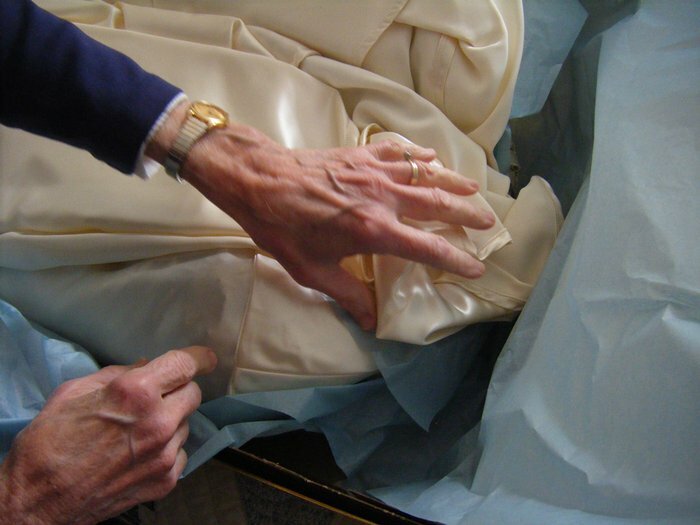 The bodice of satin wraps around and snaps separately in the back, with gathered ends. (One side is not stitched anymore and the snaps are gone. The other side is finished.) The double straps are again edged in bias binding but not as nicely folded under on the underneath side. 😉 The fabric roses are beautiful! 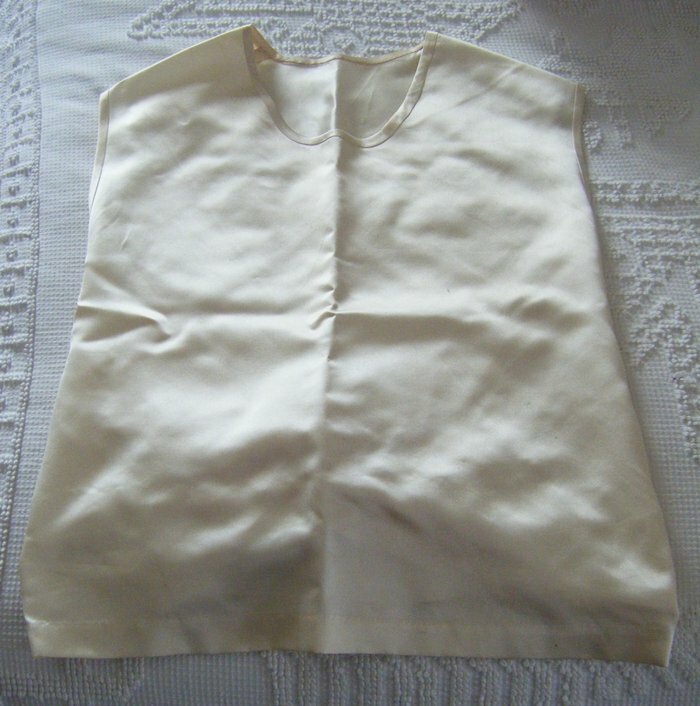 Under the satin bodice is a lace top with what I’d call netting for the sleeves. 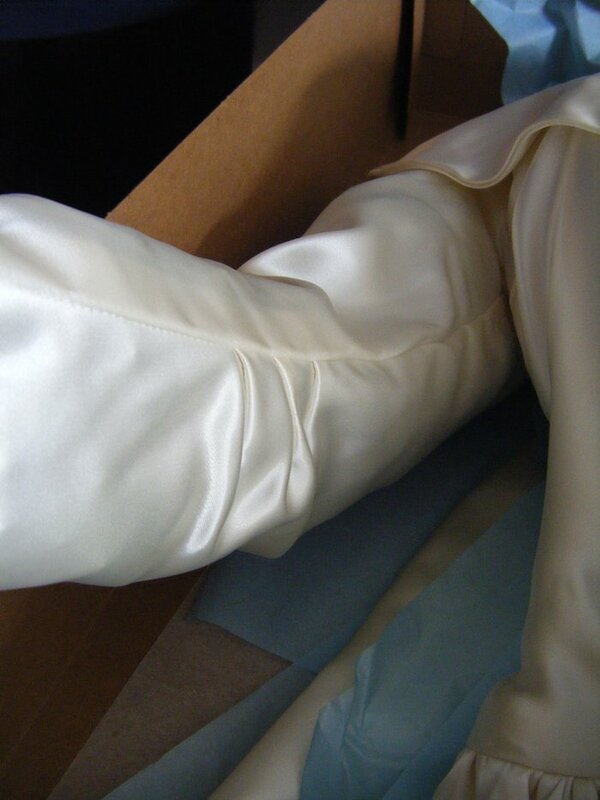 They are full-length sleeves with a point at the end. The lace is quite yellowed but not tearing at all. 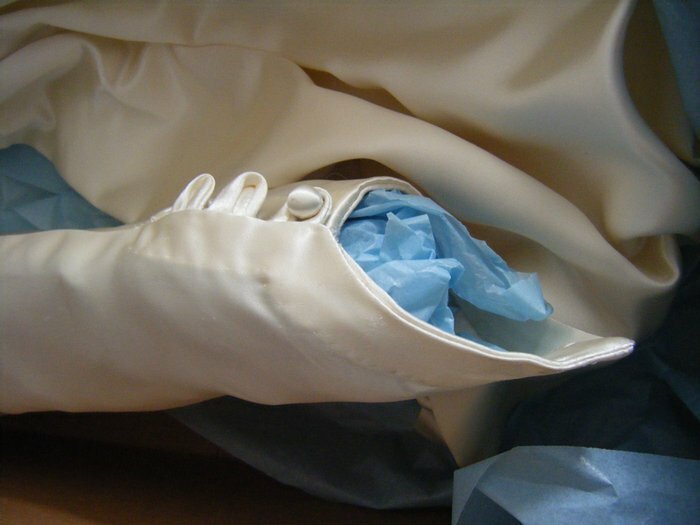 The bottom of the dress (outer) has a scalloped edge with bias binding. This is the layer underneath. 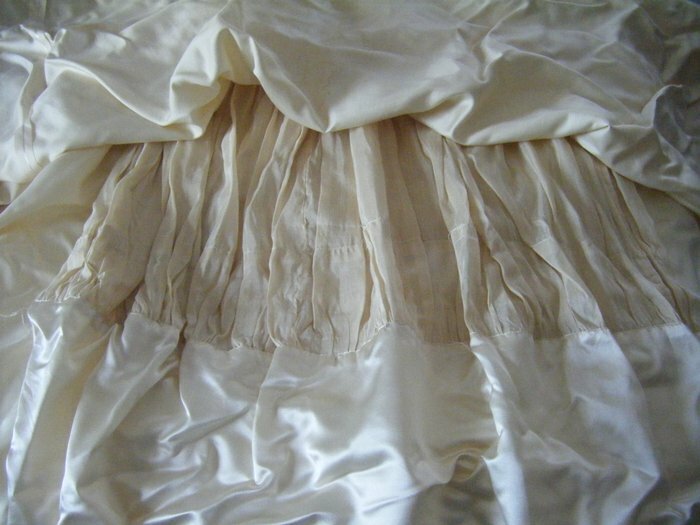 Like a rough muslin and then the last 10″ or so are the pretty satin. 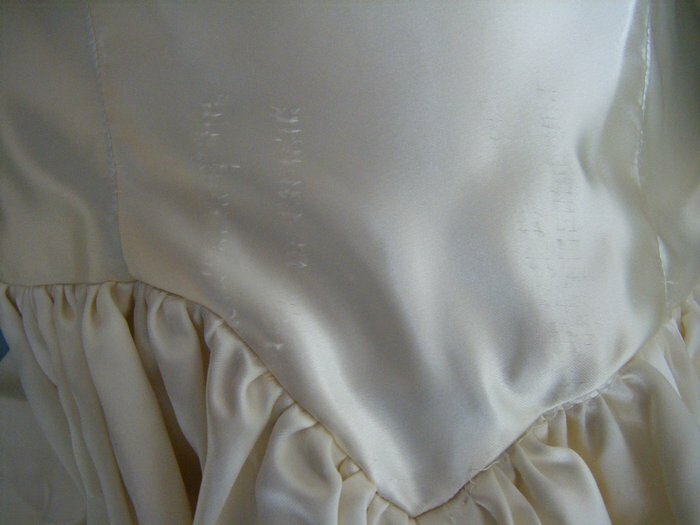 In the wedding picture, you can see this with a layer of lace in the middle. 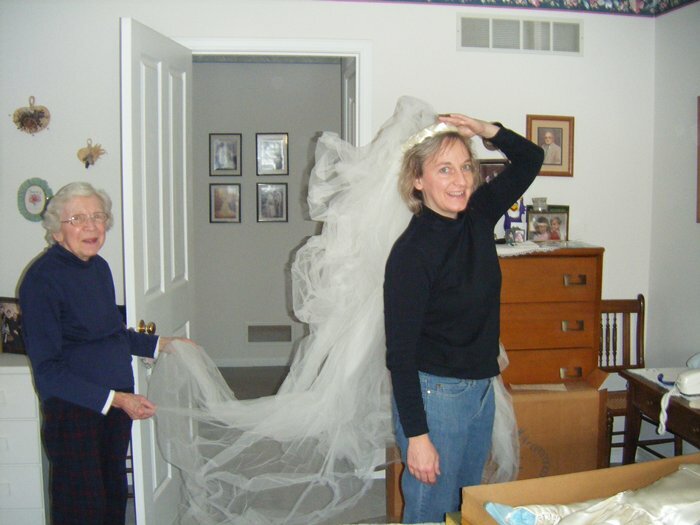 My sister, Margaret, used the lace on the end of her wedding veil (1983) so that isn’t with the dress anymore. It was quite wide… I’d guess 8″ – 10″. Lovely! I don’t know where the lace was attached to the dress. There is nothing still hanging here that it was cut from. This dress is in really good condition for being in a box all these years. Mom said it had been at my aunt’s most of this time since Grandma died. There is the spot pictured above and then another spot that is like a line dried black tar. 😦 Not sure what that could be. And to top off the afternoon, here is the ring bearer’s pillow she made as well! 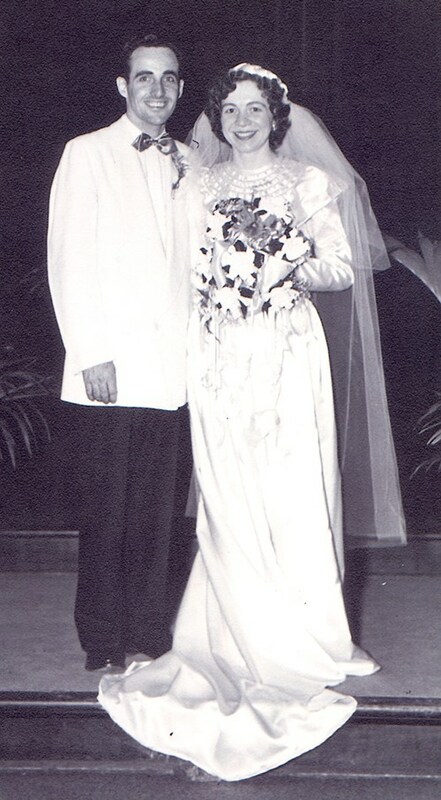 My sister, Nancy, wore Mom’s dress for her wedding in 1977. 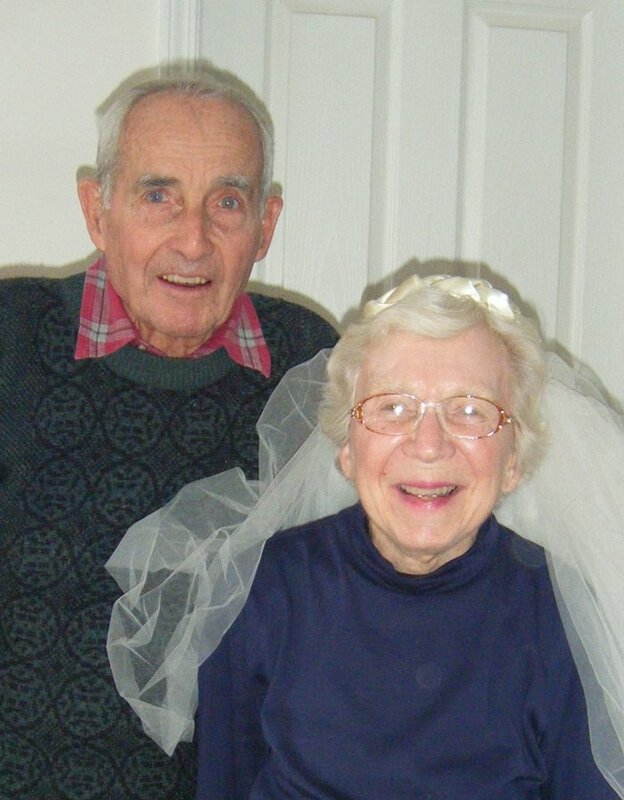 I used their headpiece with new netting for our 1983 wedding. Nancy didn’t know where the gown was and it was presumed lost or stolen during one of their many military moves. 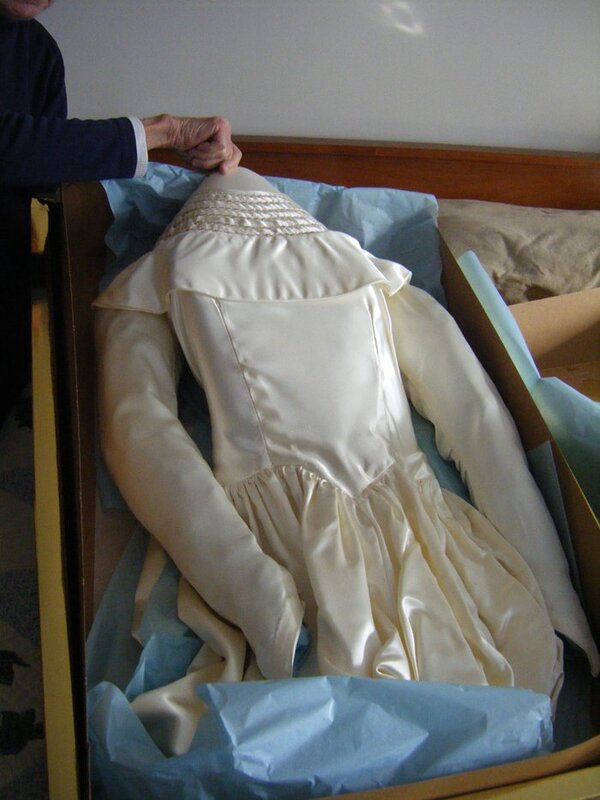 However, good news was celebrated when the gown was found this fall in my brother’s attic! (We used to live in that house.) 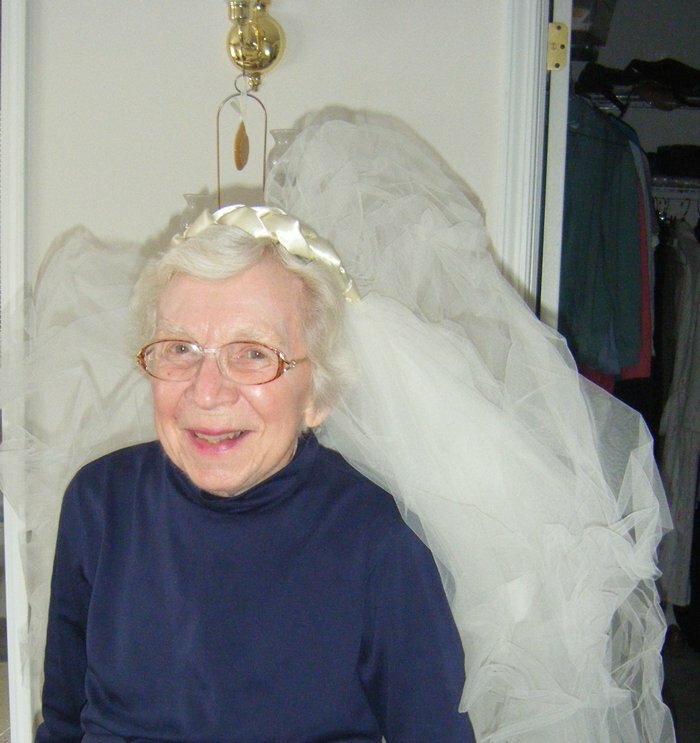 I was so happy… not that I had worn the dress but I’m a lover of family antiques (sorry Mom! 😉 ) and of course, nearly anything with fabric. With K’s new job, we know a whole lot more about wedding dresses than we had ever imagined! 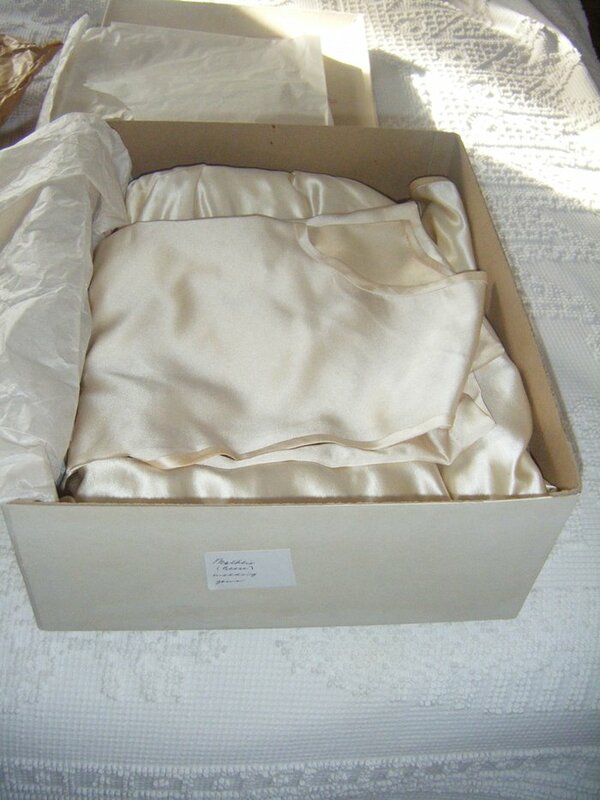 The gown is in the gold box, which was in the plastic bag, which was in the brown cardboard box. The receipt for preserving is taped to the box: $35. We started to work our way through the layers…. So we repeated our steps backwards, flipped the box over, and started again. This time we found…. 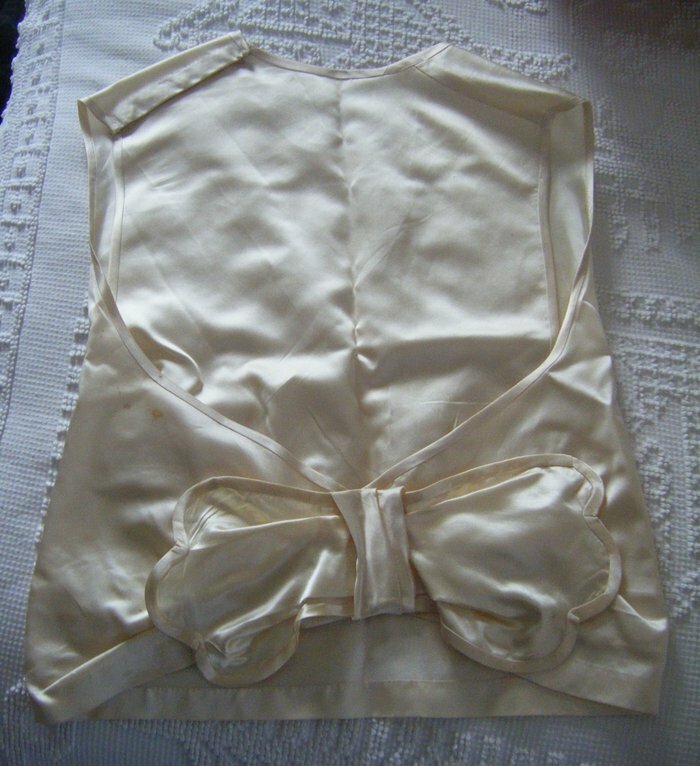 We were dismayed at these snags on the front of the bodice. 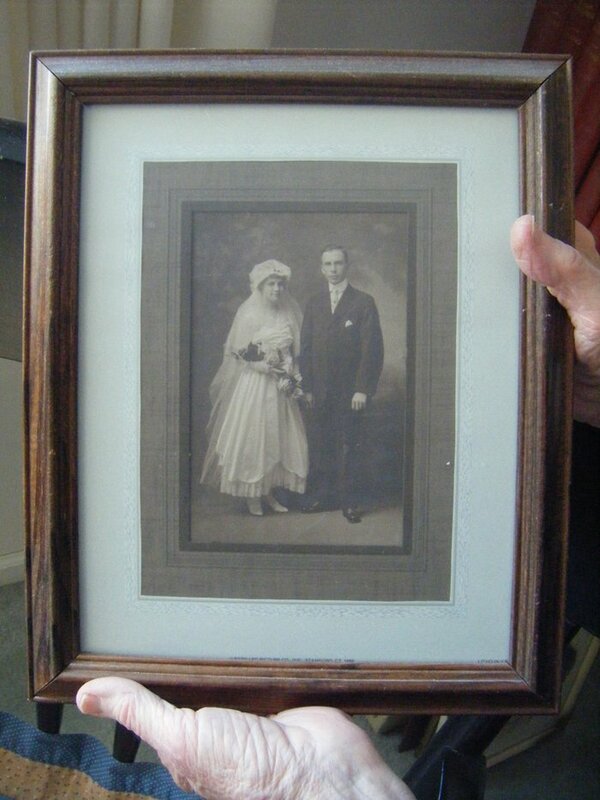 I wondered if they were from Nancy’s bouquet so we wandered to the hallway to check their picture. It seems unlikely. 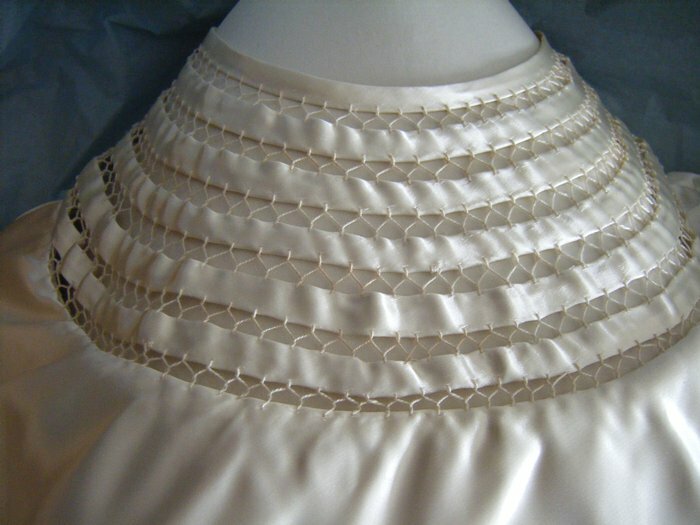 Neckline with bias strips and hand faggoting. My mom’s mom made her dress. Had I mentioned that? 😉 It is ivory slipper satin. 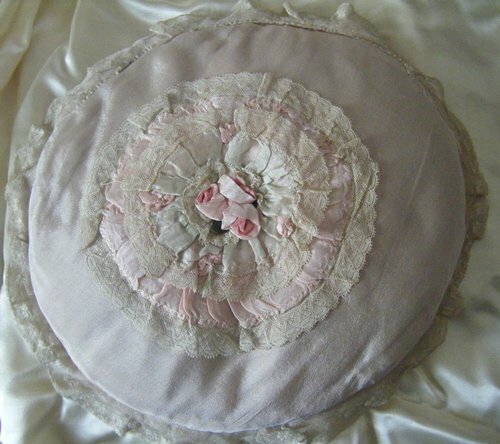 Beautiful sewing! Luscious! 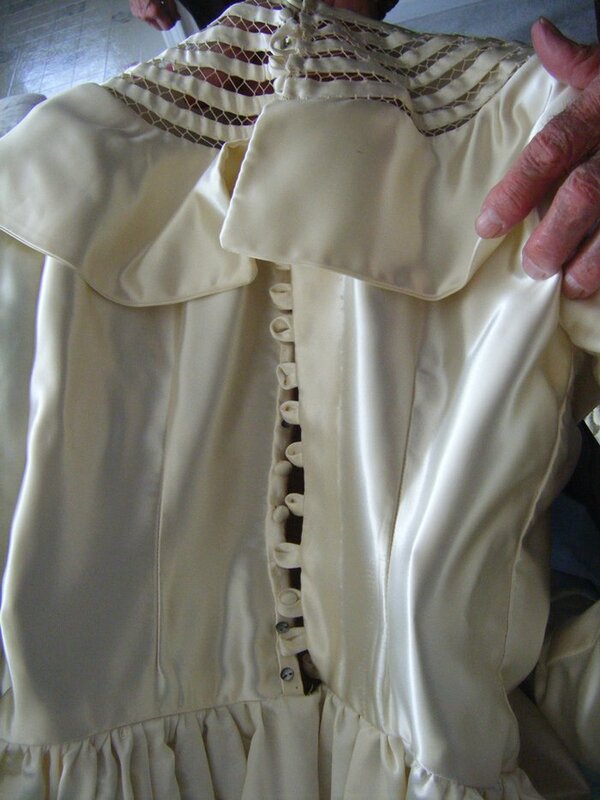 The long sleeves end in a point with 3 covered buttons & loops. We checked the back. Some of the buttons are completely gone and some are missing the satin cover. And more snag-type damage in the back; so we are puzzled about this! Next it was Mom’s turn! Mom had more up her sleeves for our afternoon…. to be continued…. While the weather held its breath last week, I made a trip to Ohio to see my parents. I had wanted to go in the fall but the fall was just not a good time for me to be gone. This worked great! My men were settled at home with food to eat & work to do so I left on Wednesday morning. I had a great day to travel, no construction in Chicago, and not much traffic. A great trip and I arrived by 4:30 OH time. We headed out to choir supper that night and I could see a few friends of theirs and some of my cousins there. Their house had had a changeover in the preceding 4 weeks. My brother & his wife moved in mid-December and the paper-signing was on Friday while I was there. Dad had built the house with a wonderful lower level that opens to the south and B&S have private quarters there. After they settle, they’ll finish off the former shop area for a family room. It is really quite nice!! For my visit, it meant that I had extra visiting time with B&S and that is always delightful! Their daughter-in-law was over for a painting project 2 nights and we had fun family times all together. Friday, they all met for the signing while I visited with a childhood friend I had invited over. I just love we have more frequent connections now with Facebook but the face to face is best of all! Friday night 3 of the great-grands came for supper with their parents. I enjoyed reading Lucy’s quiet book with her and later with Sam. I was thankful to have Bruce’s packing muscles & expertise as I had a few more things to bring home with me. I headed out Saturday a.m. and arrived mid-afternoon at my nephew’s house in Indiana. What a treat to spend time with them and have a great break in the trip! It was so much fun – I don’t even have pictures of 2 more of the greats that I got to see! I did get hugs & kissed their little cheeks so I cherish that. I even got a haircut from my niece-in-law’s sister before I headed out. Yahoo!!! It was such an easy trip… I think I’ll do this more often. 😀 Let’s hope the men feel the same way…. 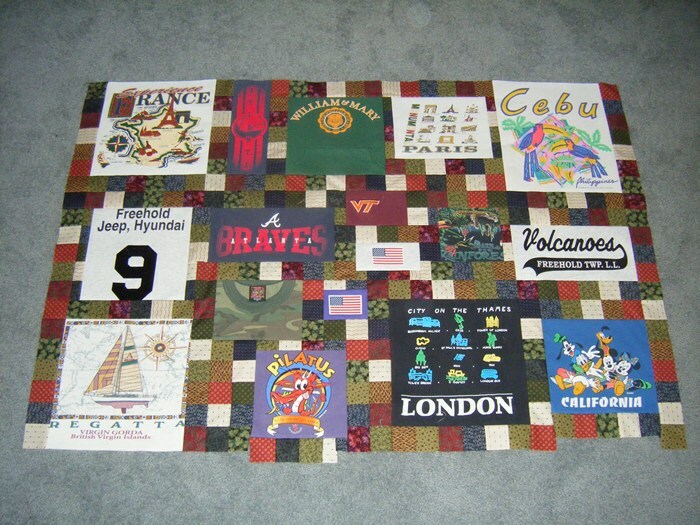 Not counting the interruptions of Christmas project sewing, my main sewing has been on Nick’s tshirt quilt. Here is the post of the start of the project. I probably have about 2/3 of it pieced but not all of it is pictured here. I have sections of the next 2 rows pieced and think there is only one after that. So it is coming along. I’m a bit behind my early (self-imposed) schedule but all is well with the mom so… all IS well! On the first Sunday of January, Phil & I met K at one of the suburbs for some after-Christmas shopping & meals together. K had about a 30 minute drive and Phil & I drove just over 2 hours. It was bitter cold outside so JP stayed home with a sore throat. Our first stop was Uno’s for pizza and their hot wings that we have fond memories of enjoying in decades past. The pizza… still yummy! The hot wings… not so. We’ll stick with Cimino’s in the next town over for now. Next we shopped for a few hours in IKEA. Ahhhh…. bliss! The few times we’ve been there, I’ve not had a plan or room for new furniture so I usually come home with either not much or nothing. This time I had a plan. A down comforter & duvet cover for our bed. I sleep so cozy now!! Next we moved across the street to the mall. The mall. The last weekend before school & work resume. Full of teen-aged shoppers. Ugh! So we didn’t last long there after checking out some shops K wanted to see. We did find a way to spend some of her Christmas money in Macy’s … on new colorful sweaters! (she wears only white, gray, and/or black for work) Actually really good prices for what I was expecting in Macy’s. We ended the day with soup at Panera’s (we are a Broccoli-Cheddar family!) and some time to just sit together before parting ways. Such fun & easy to do! At least K & I want to do this again! 🙂 And so ends, our holiday fun for this Christmas….